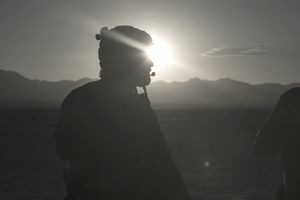 In the Air Force, airborne cryptologic language analysts translate intelligence communications or data received or intercepted while in the air. Often it's critical for this data to be analyzed quickly to prevent imminent threats, so airborne cryptologic language analysts, who generally are fluent in a foreign language, are a key part of protecting Air Force personnel while in flight. Following Air Force basic training, airmen in this specialty attend the aircrew fundamentals course, at Lackland Air Force Base in Texas, for four weeks. They'll take a foreign language course in Monterey, California for up to 68 weeks, depending on the language, and an airborne cryptologic language analyst course at Goodfellow Air Force Base in Texas for four to 19 weeks, depending on the language. Also required is spend four weeks at Fairchild Air Force Base in Washington, to take survival, evasion, resistance, and escape (SERE) training, and weapons system formal training, which will be determined by the type of aircraft they're assigned. In technical school, cryptologic language analysts will learn their designated language, as well as topics related to national intelligence organization, communications networks and techniques, geography, and methods for handling, distributing and safeguarding sensitive information. Upon arrival at the first duty station, airmen are enrolled in upgrade training to the five-skill level (journeyman). This training is a combination of on-the-job task certification, and enrollment in a correspondence course called a career development course (CDC). Once the airman's trainer(s) have certified that they are qualified to perform all tasks related to that assignment, and once they complete the CDC, including the final closed-book written test, they are upgraded to the five-skill level and are considered to be certified to perform their job with minimal supervision. For this job, five-level training averages 12 months. Upon achieving the rank of staff sergeant, airmen are entered into seven-level (craftsman) training. A craftsman can expect to fill various supervisory and management positions such as shift leader, element NCOIC (noncommissioned officer in charge), flight superintendent, and various staff positions. For nine-skill level awards, individuals must hold the rank of senior master sergeant. A nine-level can expect to fill positions such as flight chief, superintendent, and various staff NCOIC jobs. To qualify as an airborne cryptologic language specialist, a composite Armed Services Vocational Aptitude Battery (ASVAB) exam score of G-72 is required, and recruits must be able to qualify for top secret security clearance. In addition, airmen must pass a flight class III medical examination. They have to be U.S. citizens and score 100 on the Defense Language Aptitude Battery, or otherwise, show demonstrated proficiency in a designated language other than English.